Members of the Health Alliance gather to work on decorations for the Holiday Ball which will take place Dec. 1. 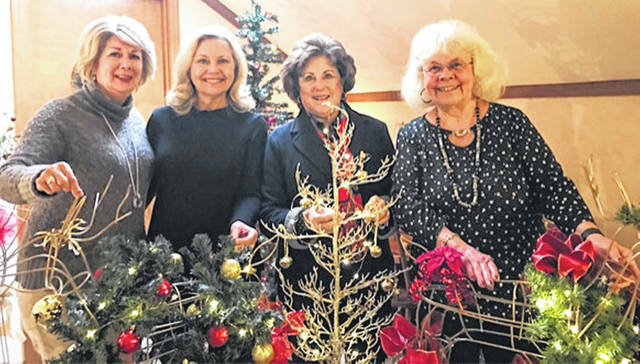 From left are Patti Cook, Chairman of the Auction Committee; Kathy Havey, President of the HACC; and Ann Johnson and Jennifer Hollon, Ball Chairmen. WILMINGTON — The Health Alliance of Clinton County is preparing for its annual charity Holiday Ball, the eighth since the organization re-established itself when Clinton Memorial Hospital was sold in 2010. The long history of assisting the hospital through the CMH Auxiliary and Twigs now continues as the HACC works each year to provide financial assistance to those residing in Clinton County or those receiving medical services here. Its main fundraiser is held each year at Roberts Centre, welcoming in the holiday season in December. Invitations are in the mail and attendance is open to everyone. The Holiday Ball is Saturday evening, Dec. 1 and includes a dinner, silent and live auction, dancing, and the opportunity to welcome in the festive season and the chance to take home wonderful auction items, many of which are donated by local businesses. This year proceeds will go to the Cancer Patient’s Assistance Program, which provides limited or emergency financial assistance to patients with a cancer diagnosis. Patients can apply through the online application at healthallianceclinton.org, or if they are a patient at the Foster J. Boyd Regional Cancer Center, they may contact the Licensed Social Worker there for information. For more information and reservations for the Holiday Ball, contact Kathy Havey at 937-382-2422.